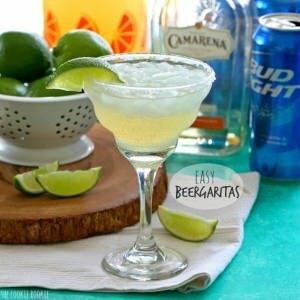 Easy Beergaritas are the perfect drink for the enjoying (or suffering through) the Superbowl! Beer and Margaritas are a match made in cocktail heaven! This is such a fun way to celebrate Summer. Course salt and lime wedges for garnish. Stir in the beer and tequila. Use more or less tequila to taste. Dip the top of each margarita glass in water (or use a lime wedge to coat the top of the glass in lime juice) and then in salt to create the salt rim. Serve over ice with lime wedges as garnish. Enjoy!